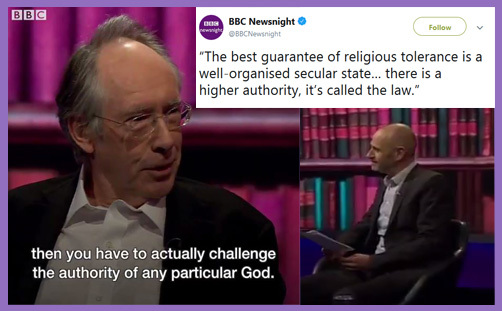 “The best guarantee of religious tolerance is a well-organised secular state… there is a higher authority; it’s called the law,” proclaimed author Ian McEwan on the BBC’s ‘Newsnight‘, in a homily which went completely unchallenged by journalist Evan Davis (chiming, as it surely must do, with his personal creed). So, religion bad, intolerant, divisive, bigoted, backward and unenlightened; secularity good, tolerant, unifying, neutral, progressive and enlightened. The secular regime necessitates the exclusion of all religious apprehensions of the good life from the public domain because only then may we become more tolerant, more liberal and more receptive to the appeal of rationality. The secular state is a neutral state, we are constantly told. It inculcates a non-judgemental political agenda which rejects all core values that are concerned with any orthodoxy save those which propagate and uphold the notion of liberal neutrality. And this liberal secular neutrality eschews the paternalistic, dogmatic and narrow worldview of religion to establish the framework necessary for the ongoing journey of humanity from ignorance to enlightenment. It encourages certain kinds of virtues which are determined empirically by what social and cultural conditions liberal democracy requires, and then sets about realising these conditions and developing secular civic virtues to fortify its creed. Secular neutrality, we are told, frees individuals from inherited roles and unchosen ties; it demands governmental neutrality on tested conceptions of the good life in order to foster compassion and tolerance. It is the only solution to the challenges of social fragmentation; the only philosophical mechanism for fostering cohesion and resisting the politics of individualism and religious identity. Secular neutrality, we are told, forges a special domain of commonality, transcending multicultural plurality and religious diversity. And the bedrock of this political commonality is the secular law which is sectioned off from the comprehensive moral views that people legitimately hold. Their moral doctrine is admissible, but only in the private domain. Our political institutions must be neutral, and so must be secular, because that is the only way of ensuring justice and fairness for all people. And this new regime of secular neutrality necessitates consensus – a consensus which until recent decades has been expressed in England through its national church. But now, due to the present deep divisions along religious, philosophical and political lines, there is an urgent need, we are told, to find alternative principles to guide the construction of just institutions which will permit peaceful cohabitation. Thou shalt be tolerant of all religious beliefs, save those which restrict the freedom of others. Thou shalt treat all citizens as equal before the law, regardless of their beliefs and practices. Thou shalt submit to the state on all religious matters, for its secular neutrality forges a distinctive and superior moral vision of the common good. In order to achieve this, the Church of England must be disestablished, for its establishment enshrines an injustice and an unfairness at the heart of the State. It must be privatised like all religion, and subsumed to programmes of publicly sponsored secularism. The tolerance that is inhibited from making moral judgements, the pluralism that celebrates diversity as an end in itself, and the individualism that makes self-expression the highest value are thereby enthroned. There can be no coercive or even cohesive state theology and no insistence that such a theology should even be necessary. The State is primarily if not exclusively the mechanism by which the happiness of the individual is promoted and individual fulfilment is realised. And the Monarch, as head of state, becomes Defender of Secularity rather than Defender of the Faith. There is no dissuasion from holding spiritual or moral principles, but neither is there encouragement or insistence that one must do so. It is not a crude sacred/secular, church/state or private/public divide, but the perpetual assertion of a via media of neutrality. But the concept of neutrality is based upon an anti-perfectionist philosophical position that there is no single definitive conception of the good that should be pursued by all people. In contrast, perfectionism affirms both self-regarding duties to seek excellences in one’s own life and others, regarding duties to promote them in other people. It is this preordained notion of ‘duties’ or ‘conception of the good’ which spurs the anti-perfectionists to seek neutrality of the state with regard to different conceptions of the good. It is evident that from the eighteenth century onwards the thinking of Locke has influenced the political and social order, in particular in his assertion that toleration and the rights of private conscience are themselves hallmarks of Christianity. Neutrality is one of the principal goals of the liberal state, not least because society, being composed of a plurality of persons, each with his/her own aims, interests, and conceptions of the good, is best arranged when it is governed by principles that do not themselves presuppose any particular conception of the good. But this raises the question of whether or not it is possible for reason to be neutral; to operate independently of any particular worldview. Advocates of secularity will no doubt cavil at the foisting of consequential accounts of neutrality on neutralists and then arguing that such neutrality is unattainable. But however powerful their objections may be, the only way of inculcating justificatory neutrality in the state in order to satisfy a true conception of neutrality is for the state to abstain from asking certain types of questions and deploying certain types of reasons. This raises a certain dilemma: intrinsic to seeking the neutrality of political effect is the likelihood that it will have a detrimental effect on at least one conception of the good to the manifest benefit of another. Yet there are manifest circumstances in which it is unfair to act neutrally – namely where there are not even prima facie reasons to be neutral. And so secular neutrality is seen to be a conceptual impossibility, because the condition of neutrality is unrealisable: a theory of neutrality is itself subject to a particular conception of the good and makes very specific demands of the state. There is no neutrality to be found because neutrality needs as much justification as any other position. If a state seeks to be neutral in the effect of its policies then it requires a greater level of state intervention to ensure that inequalities are negated. It also requires that the effect of all policies is balanced for all conceptions of the good. The alternative is that the government is neutral with regards to the justification of its actions, and this demands either the disestablishment of the Church of England or the establishment of the Mosque of England, along with the Gurdwara, Mandir and Vihara of England, and state recognition for the multiplicity of competing religions and beliefs (including non-beliefs), which are a feature of the fragmented postmodern context. Secular neutrality appeals to the egalitarian instinct that one group should not be more advantaged or enjoy greater privileges than another, but it leaves unresolved the need to adjudicate between competing conceptions of the good. It is manifestly necessary to deem some conceptions of the good as being legitimate or beneficial and others as not. And in doing so, there is a need to refer to some ‘higher code’, which in liberal Western democracies has traditionally been identified with Christianity and the principles of the Enlightenment. These, in England, have historically been embodied and articulated by the Church of England. There manifestly needs to be a method for deciding when the pursuit of one good inhibits the pursuit of another, and therefore categorising some activities as legitimate and others as not. The question of what form the state’s neutrality should take on various matters must be answered by reference to something other than the idea of neutrality itself, because this would be to use neutrality as a comprehensive conception of the good and therefore violate its own principle. The answer must be provided by a theory of the state’s responsibilities, which itself is part of a larger moral theory. The neutrality of the state needs to be regulated, and the means by which this is done is usually through recourse to a higher moral or religious conception of the good. There must be ground rules that govern conceptions of the good without restricting the ability of any legitimate conception of the good to be pursued, not to mention an agreed mechanism by which such ground rules are agreed. For historical reasons, as well as present sociological ones, it may be adduced that the Church of England is well placed by experience to remain at the forefront of this pursuit, for is not our system of law – this ‘higher authority’ to which Ian McEwan appeals – fundamentally morally and manifestly Christian? Might not Evan Davis have politely pointed that out?